Komen New Orleans works to ensure that all people, regardless of race, income, geographic location, sexual orientation or insurance status, have access to screening, and if diagnosed, to quality, effective treatment and treatment support services. Our Community Grants program is designed to make systemic, lasting change in our community. We are proud to have invested more than $6 million into New Orleans since 1992. Our current funding cycle, April 1, 2017 – March 31, 2018, boasts 9 projects totaling $329,000 that will provide breast health and breast cancer services to thousands of low-income and uninsured women in our community. For a complete list of current grantees, click here. 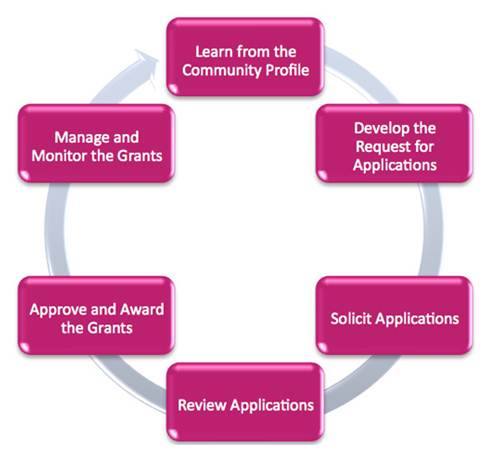 Please view the image below to learn more about the specific steps in our grant making process. Komen New Orleans is committed to increasing our fundraising efforts, as each year the needs of our community are more than we are able to fund.